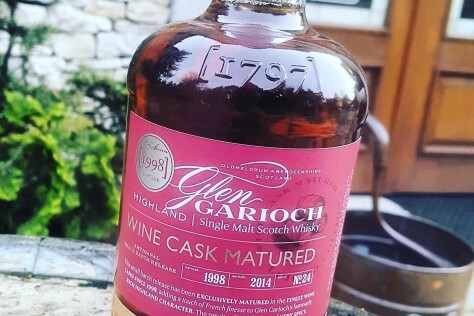 GlenGarioch 1998 (Bottled 2014) Wine Cask Matured / 48%/ – How often does one have a chance to taste whisky aged entirely in ex-red wine casks? Not too often, at least we didn’t come across one until Glen Garioch release from 2014. The whisky distilled on June 23, 1998 was aged for over 15 years in finest Bordeaux barriques sourced from Saint-Julien, located in Médoc sub-region. The casks have been hand selected and married together by Rachel Barrie, the master blender at Morrison Bowmore. The whisky was bottled at 48% abv, unchill-filtered with an outrun of 5400 bottles. The Highland-Bordeaux connection brings out fruity sweetness, maltiness and spice. Nose: fruity and malty, strawberries, raspberries, cherries, rosehip marmalade, raisins, toffee, honey, cinnamon, ginger and touch of oak. Palate: rich, fruity and spicy, lots of red berries, damson jam, orange peel, milk chocolate, ginger, pepper, cinnamon, cloves and hint of licorice. Finish: long and spicy with distinctive fruity notes. Buy bottle at Dom Whisky Online lub sklepie w Redzie, ul. Wejherowska 67.